Mr. Tur Tur is a multi-functional modern furniture piece that reinvents traditional home furnishings and offers a contemporary compact solution for small spaces. 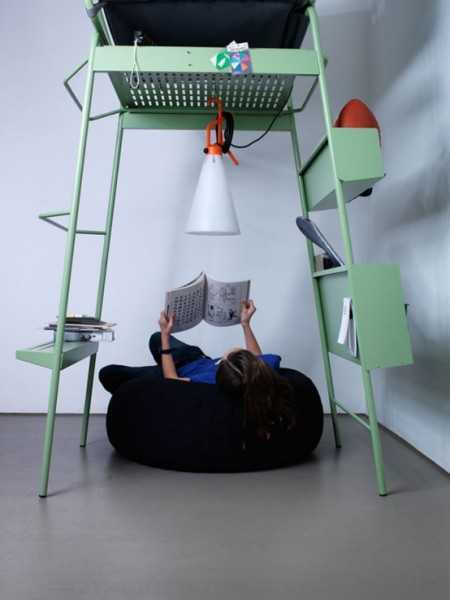 It is a combination of a shelving unit with a large chair raised high above the floor. Design offers convenient and space saving unit, perfect for decorating small rooms. The design is original, surprising, and provocative. Mr. Tur Tur is a fairy-tale character who has a very distinctive characteristic. The further away from him you are, the larger he seems to be. Will you dare to come near the giant? Tur Tur is a unique furniture design project. The piece looks like a perch. 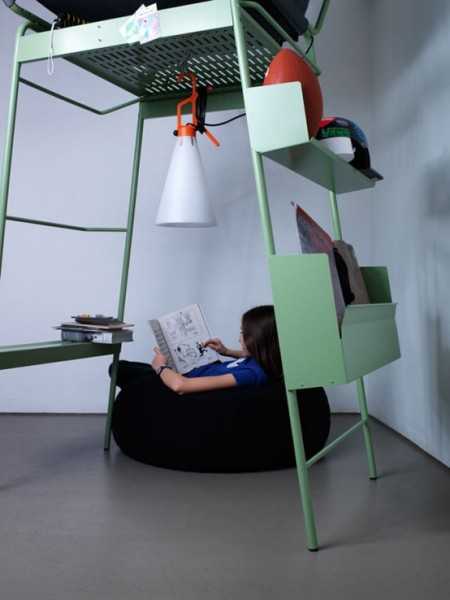 It can add a playful design to kids rooms or create a tree house-like feel in a teenage bedroom. Two level design with a sturdy frame brings a whimsical look into room decorating. The metal architecture gives a touch of retro-modern design to the living space and enhances an industrial vibe in a bedroom. 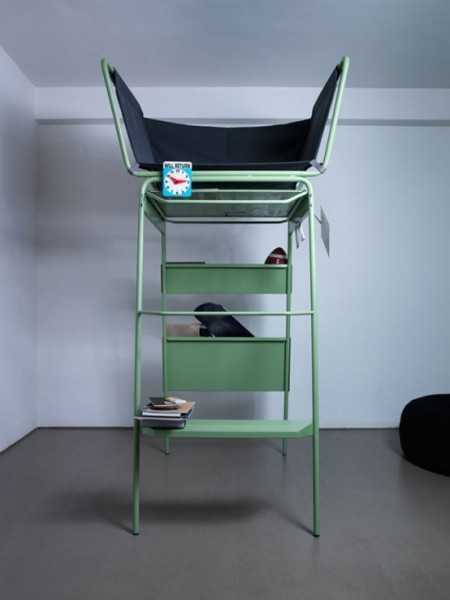 A steel frame and a large soft cushion create a comfortable chair on the top of the metal shelving unit. Shelves provide storage and work as side tables for other furniture pieces that are on the floor. Based in Cologne designer created the multifunctional and space-saving furniture that represent a blend of brutal functionality and efficient usage of vertical space. A ladder units a chair, a shelving unit, and a side table. Original lighting design adds a pendant light to illuminate the under-chair space. There is room to decorate this modern chair by hanging accents and personalize interior design in a practical way. The multifunctional furniture can maximize small spaces and create functional, space-saving, and contemporary small rooms for students. Student demand is polarizing today. Some people seek premium accommodations in en-suite flats with a great view as standard, while others are cash-strapped, and are looking for modest rooms and the bare minimum. They will like having Mr. Tur Tur in their small spaces. Ideal for decorating small apartments, homes, and student rooms, the contemporary furniture piece blends the rough simplicity and industrial style. The space under the chair is free for a full-size bed, a computer desk, and an office chair. The small areas around and inside the structure are perfect for a closet, a sofa or a compact set of dining furniture. Indoor plants or small artwork can decorate the metal structure to personalize the design. This original furniture design is simple and practical. Almost neutral pastel green color is pleasant and easy to match. The metal frame is durable and adds versatility to the contemporary furniture design by Eric Degenhardt, www.eric-degenhardt.com/. Suitable for small office designs and adventurous teenage bedroom furnishing, the modern metal chair is perfect for large home libraries with floor-to-ceiling bookshelves.